I tried again to tidy up the white stripe on the P-51D wing but I only made it worse. Finally, I decided to strip the wing back to bare plastic and start again. Here is the current state of things - I have primed the wing, sprayed the white, masked it out and given it a coat of RAF dark green so hopefully I am back where I was. 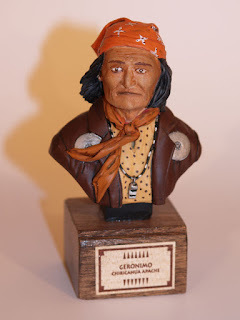 Little Wing Jicarilla Apache 1850 - Pili Pili 120mm figure. Maybe I should stick to figures? This one has been on the go for about 9 months or so. I had some great difficulty with the beadwork. Finally, i took it to the club last month and asked for suggestions. The best one came from Brian Wakeman (of SAM magazine fame!) who suggested that, instead of trying to do p[arallel lines, I try a simpler pattern. My wife, who wants this on her dressing table with all the other Native Americans I have done, told me to get it finished as she was happy with it. I spent last evening tidying up the beadwork as best I could and the put the figure together. "What did the Red Indian shout as he parachuted from the aircraft? Nothing, aviation hadn’t been invented at the Little Big Horn! Dave Pennington's Geronimo showed Dave’s exponentially increasing ability with figures; always a bonus as his aircraft always seem to end up in the bin!" I have done some masking on the Catalina - the black de-icing boots but that is all the progress I have made.